Work in any culture is…well, work. Sometimes enjoyable. Often hard and exhausting. Sometimes challenging, more likely because of the people with whom you work rather than the work itself. That applies to any kind of work. When you are working with your God-given skills (and assuming you are doing work that is legal and moral), all work can be an act of worship. Yes, I said ALL WORK, not just if you are on staff of a ministry organization. You might spend two hours a week at church or Bible Study and get the wrong message that the other 166 hours of your week are second class compared to church stuff. An interruption to “ministry.” Lacking purpose, whether you are earning income or not. Something to endure until you one day can do something meaningful (like retire and go on the mission field). But, that is wrong. Biblically wrong. There is no “sacred/secular” division in a Christian’s life. Everyone at every level is doing sacred work. Seriously! Your time at church and in a small group is supposed to be“the stimulus to launch you out into the world—which includes the marketplace—prepared to take the hope of Jesus with you.” That’s the message I heard recently at a Work as Worship* conference. And, it is a message that is so needed in our Christian communities. O God my Creator and Redeemer, I may not go forth today except You accompany me with Your blessing. I was in a Bible study yesterday talking about how pain affects our lives and our perspective of God’s goodness to us. We were studying the Mark 5:21-43 accounts of the woman who had been hemorrhaging for 12 years and the father named Jairus who needed Jesus to heal his 12-year-old daughter. Our discussion question was, “Describe any of your own painful circumstances that have driven you to Christ. What did you learn about His faithfulness through that experience?” As each woman shared her own story, it was obvious that some could recognize God’s goodness to her in the time but others were still struggling with God’s goodness because the pain hasn’t gone away or been resolved to their satisfaction. Most of us don’t like to wait for God to work. And, we certainly don’t like a “No” answer! Be. Honest. Here. 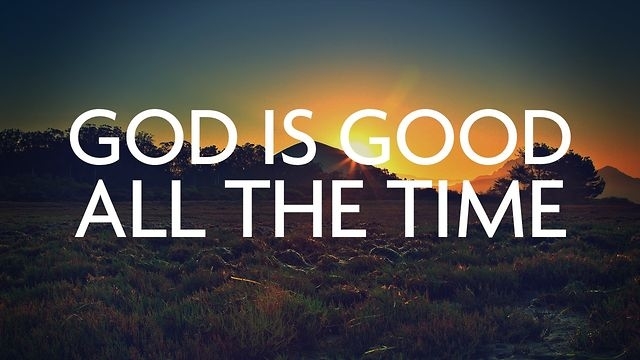 We say to each other, “God is good all the time,” but do we really believe it? Last year—at about this time—I wrote about Anna starting junior high and how students can glorify God at school. You can read about it here. What about us as parents? What about those of us who anticipate challenges that will in no doubt bring trials, problems and difficult situations at school? Job has been the book of study lately for a group of women in my community. The first day we started, my friend and I commiserated that we get a little anxious when Job's story comes up. Kind of like God is trying to prepare us for the doom to come. We shrink from the prospect of suffering, even though we know there's purpose in it. We are like Christ sharing the fellowship of his suffering (Philippians 1:29). But it's still hard. Many of us know what insecurity looks like. When it appears and sets in our lives, especially in our abilities—at our jobs, our homes, our relationships and how we parent—we attach ourselves to someone or something we feel is stronger, more competent. Just got home from taking my student to walk her schedule and practice opening her locker at her new school. Despite all the fears that come with her disability—you can read about that here—I feel so thankful for God’s faithfulness in Anna’s life, as she gets ready to start junior high in a few weeks.